For the village in Iran, see Yafran, Iran. 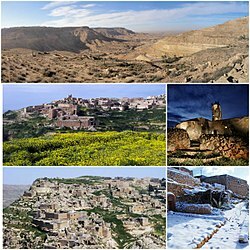 Yafran /ˈjɑːfrən/ (Arabic: يفرن‎ Ifrin), also spelled Jefren, Yefren, Yifran, Yifrin or Ifrane, is a city in northwestern Libya, in the yefren District in the western Nafusa Mountains. 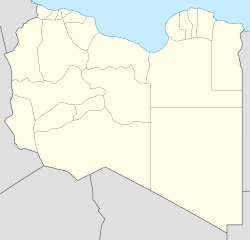 Before 2007, Yafran was the administrative seat of the Yafran District. Yafran people, as in other cities of Libya, have demonstrated against Gaddafi. Subsequently, Yafran was exposed to bombardment and siege by Gaddafi forces. As of May 2011, Gaddafi's forces had shut down the water system and blocked food supplies and held the western part of the town with some 500 rebels in the eastern section of Yafran still resisting. Yafran fell to Gaddafi's forces sometime in late May or early June. The centre of the town was used as a position for "government tanks, artillery guns and snipers". On 2 June, rebel forces retook the city center and started to clear the area of Gaddafi's forces. On 6 June, an on-site Reuters journalist reported that the pro-Gaddafi forces were nowhere to be seen in or around the town. ^ World Gazetteer. "Libya: largest cities and towns and statistics of their population". Archived from the original on 4 December 2012. Retrieved 15 October 2011. ^ Boudreaux, Richard (1 June 2011). "Conflict Hardens in Libya's Mountains". The Wall Street Journal. "Yafran, Libya", Falling Rain Genomics, Inc. This page was last edited on 19 October 2018, at 13:55 (UTC).